Love the use of the two symbols - the heart and the chemical symbol - very clever! I always think black is easy to photograph... but run into trouble time and again! 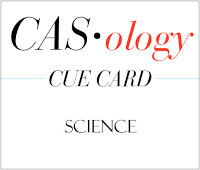 LOVE your clever take on the cue! Looks beautiful to me! That is such a great sentiment and LOVE your layout!! You have a card design worth it's weight in gold, Jen! Super CAS and cute! Brilliant idea! Love the heart of Au. Perfectly CAS Jen! I am with you on photographing black (see my card post on the 1st). This is a wonderful interpretation of the cue word, and I can see that it would be so stunning and striking in person. I actually think your photo is pretty good, too, but then I think that we are often our worst critics. 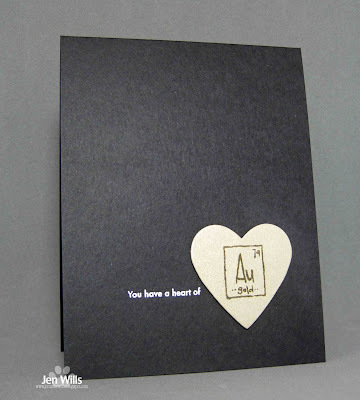 As a chemistry major (not that I use any of the stuff that I learned in college), I love this card! Not that we should make our cards based on their ability to be photographed... ;) This is so classy and sciency! :D And you know I love that perfect white on black embossing. Yep, it is not easy getting a photo of gold on black...but I think you did a great job! I also love the simplicity of your card, and your color choices were totally perfect (even if hard to photograph)! The use of elements symbols is so fun. Your card is no exception. Cute and simple!!! Love the black card base! It makes the card so stylish! Your idea and the photo are great, Jen! You are too brilliant, and ALWAYS! !